Peeling hardboiled eggs: Why are some eggs easier to peel than others? Blame carbon dioxide. Food Explainer: Why Are Some Boiled Eggs Easier To Peel Than Others? Will these eggs be easy or hard to peel? Depends on how old they are. The third entry in a new occasional series in which we demystify all manner of gustatory conundrums and culinary puzzles. If you have a food-related question you’d like answered, see the email address provided below. Peeling hardboiled eggs is a roll of the dice. Some eggshells slip right off the white, but others cling desperately, no matter how you pick at them. Why are some eggs easier to peel than others? As a rule, the fresher the egg, the more difficult it is to peel cleanly. The albumen (white) of a just-laid egg contains a store of dissolved carbon dioxide, a weak acid. (CO2 is what makes very fresh raw egg whites appear cloudy.) Over time, the gas exits the egg through thousands of tiny pores in the shell. As this happens, the pH of the white gradually increases, making it less acidic. Why does acidity matter? The inner membrane of an egg—that translucent skin that envelopes the albumen—is made partly from a protein called keratin (also found in hair and nails), which is tougher in an acidic environment. At the lower pH of a fresh egg, the proteins in the egg white bind tightly to the keratin in the membrane during the cooking process, which makes it nearly impossible to remove the shell without chunks of white attached. Up the alkalinity, and the keratin softens, leading to a looser bond between the white and the membrane—which means hassle-free peeling. An average commercially produced egg, if kept chilled, reaches the ideal pH for peeling (8.6 to 8.9, if you’re counting) 7 to 10 days after it’s laid. Egg cartons are marked with a Julian date—a numeric system that goes from 001 for Jan. 1 through to 365 for Dec. 31—indicating which day the eggs were packed, which is often the same day they were laid. 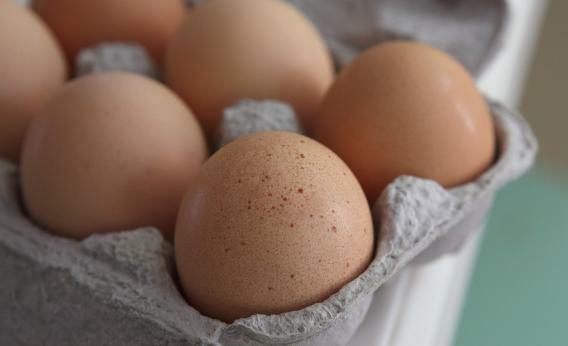 But if you don’t feel like counting the day of the year to figure out how old your eggs are, keep in mind that eggs are typically delivered to supermarkets between 3 and 5 days after they’re laid. For smooth peeling, then, simply remove any airtight seals from the packaging to allow the CO2 to escape and refrigerate the eggs in their carton for 4 to 7 days before hardboiling. There are some exceptions. Just before an egg is laid, the hen applies a protective coating to the shell called a cuticle or bloom, which slows the rate of CO2 loss and prevents contamination from microorganisms. The Agriculture Department requires that all inspected eggs be washed and sanitized, a process that removes the cuticle. However, if you buy your eggs from a farmers’ market or farm shop, the cuticle probably hasn’t been washed away, which means that the eggs will take a few days longer than their commercial counterparts to become easy to peel. But you’re not always home free if you buy your eggs from the grocery store. About 10 percent of commercially produced eggs are sprayed with an odorless, tasteless mineral oil to replace the cuticle. The mineral oil seals the pores in the eggshell and prevents CO2 from escaping, which means that oiled eggs will never peel well. Unfortunately, processors are not required to indicate if their eggs have been coated with oil, but a slightly shiny surface is a telltale sign. Food Explainer thanks Glenn Froning, advisor to the American Egg Board and professor emeritus of the Food Science Technology Department at the University of Nebraska, Lincoln.